Packing lunches every day? Our family eats most of our lunches from home, so this is not my area of expertise. Sure, I often have to pack food to take to soccer and basketball games. I try to get creative. I have fun figuring out healthy, real food meals and snacks to pack when we’re on the go. But for all of you who pack lunches for school or work day after day – you could likely use some fresh ideas! That’s why I called for back-up on this one. I knew Katie from Kitchen Stewardship had an entire eBook on this subject. She feeds her family real food and does a rockin’ job of it. Her kids attend school outside the home, so she packs lunches for them every school day. I asked her if I could take a look at her eBook and share it with you. 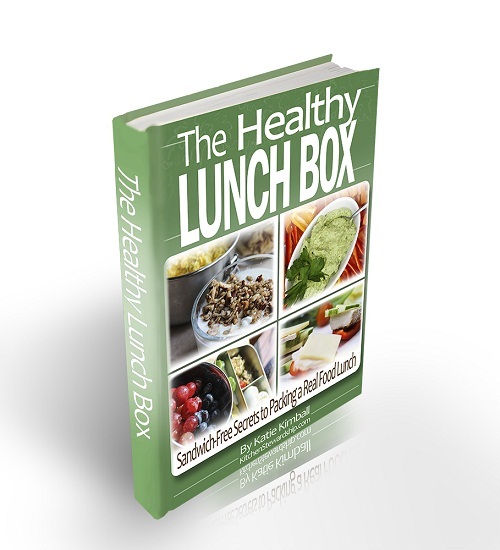 I figured I would just give it a quick glance-through before letting you know how helpful a resource it might be for those of you interested in packing a healthy, real food lunchbox. Right. I should have known Katie’s book with draw me in. I ended up spending hours pouring over this book’s contents. I may not need to pack many lunches, but wow did I learn a lot! I gained wonderful new ideas for food I can pack for all of our road trips and game days. Shucks, I got new lunch ideas to put directly on our table during our homeschool days. You need to check out this book. Katie assumes that you already know how to make a PB&J, and that you and your family are likely a little tired of sandwiches day after day. She also knows that many of us are working to add a variety of whole foods to our diet – which often means that we don’t want to eat many sandwiches in the first place. You won’t believe all the wonderful ideas for packed lunches she shares. Not only does she share loads of money saving, real food, fun lunch-packing tips – she shares page after page of recipes too. There are so many great lunch ideas that don’t involve bread and lunch meat. It is inspiring! Through February 12, 2014 we can all get a 50% discount on this eBook! That means the Healthy Lunch Box Premium Package will only cost $4.98. It is so worth the money for all the information and recipes in this book. Use the code HHhalf for the discount. And share in the comments: What are your favorite non-sandwich lunches to pack? This post contains affiliate links. Special thanks to Katie at Kitchen Stewardship for allowing me to check-out her book and for offering us a discount too! The thermos is my best friend. My daughter dislikes sandwiches so that has never worked for us. I fill the thermos with hot was the minute I wake up to warm it, then pour the water out before filling with yummy leftovers. My daughter enjoys a wide variety of lunches this way that are healthy and hearty. Soups, casseroles, fried rice all yummy. She also enjoys wraps. Peanut butter with thin apple slices is her favorite wrap. That would be hot water that I fill it with, typing faster then I can think. Also invest in a very good thermos, I believe I paid $15 for ours, so that they food stays at a safe temp until lunch. Exactly what I was going to say! A Thermos gives my children a great variety of hot lunches, which is what they prefer. I also fill the containers with boiling water prior to filling with warm food, too. I second the Thermos brand suggestion as well. I have a non-Thermos and it doesn’t keep the food very warm. My kids tell me their food is still hot at lunchtime when packed in our Thermos containers. I work full time so I pack my lunches. I pack stuff that’s “fun” – stuff I would’ve loved to eat as a kid, because it makes bringing lunch from home more exciting. They make all kinds of tupperware containers that have divided sections so you can even make yourself a cool smorgasboard. Some favorites: cheese/sausage n crackers, mexican bean dip w/salsa and whole wheat tortilla chips, homemade version of Mcdonalds fruit and walnut salad, heck – any kind of salad using leftover meats from dinner, fruit kabobs, veggies and hummus, just to name a few. Search Pinterest for “school lunch ideas” and you will be blown away by how fun and healthy lunchpacking can be. I will look at Pinterest too-thanks for the idea! My kids love a sliced stick of raw white cheddar cheese wrapped in a piece of nitrite-free ham. Great for when there’s no bread! Thanks Laura…I was just thinking of asking you if you had any healthy lunch ideas….my daughter’s school does not have a microwave for the kids so I run out of options when thinking about her lunch…and the hot lunches usually leave something to be desired in terms of flavor and nutrition….and they are a peanut free school! I bought the e-book and am looking forward to reading it. Thanks Julia for the Thermos idea….I love it and am planning on trying it. I enjoy reading your blog and love your recipes. I’m assuming this is not intentional, but you have some slightly pornographic advertising on the side of your blog. I’m not sure if that’s something you want, but thought I’d let you know. ACK! I don’t see it on my end, so hopefully it went away forever. If not, let me know what company is represented and I’ll sent it to my ad agency so they can remove it. Thanks for bringing this to my attention! I still remember my mom filling my wide mouthed Thermos with hot foods for me. I got mac n cheese, soup, spaghetti, and whatever casserole leftovers we had. What great memories but my kids eat at home with me and don’t have a lunch box. Pretty much everyone in my family digs cauliflower, but I always either serve it mashed or steamed and that gets pretty boring-yawnnn… So, I have this recipe on my list this week. Hoping to shake things up a bit with some Buffalo Cauliflower Bites! For sandwich alternatives, my girls like whole wheat pita chips and humus, whole wheat muffins, veggie pasta salad, hard boiled eggs, whole wheat bagels and peanut butter, whole wheat crackers and cheese and trail mix. I prefer to send lunches I can pack and refridgerate the night before as my husband usually loads our girls backpacks in the morning.